I so enjoyed this past week with all the posts about Tasha Tudor. I hope you take a peek at my Tasha Tudor Day post. Before I packed everything up from the tea, I decided to use on of the blue and white Calico teacups for Miss Spenser's Teacup Thursday. I still love my set, even though I have it packed away only to be used for special occasions. My blog comments will be late on Thursday as I'm babysitting my niece Ms Maria again. FUN! One of my favorite teapots! I love to use this teapot with my Calico set! The day is almost gone and I hope to post this before the clock chimes twelve midnight! Jim and I had a wonderful day together celebrating Tasha Tudor Day. We just watched both Take Joy and Take Peace to end the day with a heartful of lovely thoughts and bittersweet memories. I enjoy both programs so much yet it is a bit sad to watch and listen to Tasha now that she is no longer with us. But the reason we remember her on her birthday is to celebrate her life and to thank her for what she has given to us! As this is the Year of the Garden, I decided to have a garden tea for Jim. I always do a tea for my girlfriends and he seems to get the leftovers, so I wanted to give him a "full presentation" as he calls it! I like this picture of Tasha in her garden. What a lovely garden she had and how she enjoyed her time working away in that wonderful magical place. It's from an engagement calendar I recently acquired. I decide to carry on my blue and white theme as I featured on Teacup Thursday. Here's a picture of the offering. It was really a fun menu to offer using fruits and vegetables as summer provides an abundance of each. they remind me of her. I began the tea with a borrowed Strawberry Champagne Chiller from Trish at Sweetology. Her blog is wonderful and so was the drink! Nice on a hot summer afternoon. Here we are enjoying our backyard and our Tasha Tudor Day tea on a lovely summer day. While we were eating, a humming bird kept coming by and our little squirrel buddy came begging for his treats. I had asked the members of our Tasha Tudor group to share today how they came to be a Tasha fan, so I think I should add that to my post. When our girls were young and we had our pharmacy, we could never get away for long vacations, but we did take many long weekend trips around Oregon. We loved to go to the Oregon coast and there was a book store at Newport, OR that we all really enjoyed. I was waiting for the girls as they were enjoying the children's books and I found Bethany Tudor's book DRAWN FROM NEW ENGLAND which was about her mother Tasha Tudor. I bought the book and fell in love with her work. There was a great little book store in Portland-The Skidmore Fountain Books and I became a very good customer...buying every Tasha book I could! She would call me when she received a new shipment. So I became a fan through her art and her children's books. Down the road, I found the internet site and I was so very excited! I now belong to another site TAKE PEACE and four years ago we had a Kindred Spirits Gathering in Vermont. How fun it was to finally meet all those I had been emailing for years! Since then I have had the pleasure of meeting more members out here on the west side of the US. LaVonne from Montana has become a very dear friend who has come to visit me several times and I'm hoping she will be back soon! Kristen has family in Oregon and has been to visit my home twice. 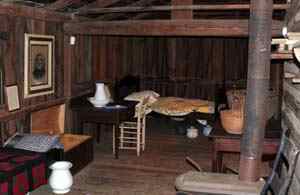 LaVonne and I have traveled North to meet Clarice, Angie, Linda Fox, Jane, and Robin. Oh the laughs and the fun times we have had! I did meet Christine thanks to Clarice last fall too. The friendships that Tasha has given me are one of my most favorite things about finding Tasha! I so hope to meet more Tashettes in the future. So, as I say good night on this Tasha Tudor Day, I say thank you Tasha for giving me the gift of friendship with so many dear friends. You have inspired me to try new things, have given me the OK to play with dolls, and to realize that I am never too old to follow my dreams! Thanks to my Jimmy who shares his time with me to have so much fun with Tasha and all that it means to me in my life. I love you big guy! Welcome to another Teacup Thursday with Miss Spenser's Teacup Thursday! 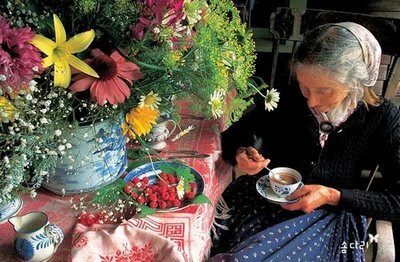 I love this picture of Tasha Tudor having tea.This is an exciting week for our Tasha Tudor group. Sunday, August 28th, is Tasha's birthday and since her death, we have been remembering her fondly by celebrating her birthday in some special way. Tasha was a children's illustrator who had a long career. I adore her work. She was an amazing woman and the very best thing about her is all the Kindred Spirits I have met through her work. I was blessed to attend a gathering four years ago in Vermont and since then I have met several more members in person and hope to meet more in the future. I am a member of Teacup Thursday via the Tasha group as Donna is a member of our Take Peace Tasha group too! I have been saving a little children's tea set for this Teacup Thursday to share with my tea cup friends. Tasha's dolls enjoyed blue and white china was well as Tasha. I have always wanted a set and we found this one early this summer at an estate sale. My dear Tasha friend made the framed Tasha silhouette for me. The little tea set was made in Japan. The little teapot/teacup set I'm featuring was a gift given to me by my sweet sister-in-law Brenda and my brother-in-law Allyn a few years ago when we were in Illinois for our niece's wedding. I packed it well in my suitcase! I don't know anything about it...not sure if it's old or new, but I have enjoyed it very much. 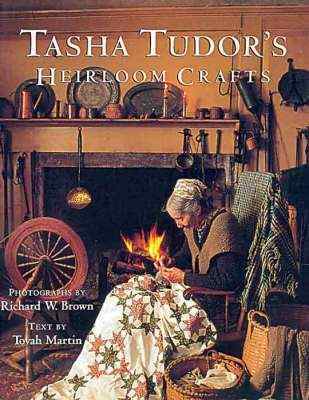 The book here is one of my favorites...Tasha Tudor's Heirloom Crafts. Beautiful photos and one that I enjoy reading over and over. Here's the bottom of the teacup. I have no idea what these marks tell us. There's no name or country. Time for a cup of tea? What's your pleasure? I seem to always go back to a vanilla black tea. I am looking forward to the coming of fall and cooler weather. I love a cup of tea in the evening. I took these photos outside today as our Tasha group has named this year the Year of the Garden. It's been fun to focus on a theme each year.It gives us a way to explore Tasha's interests and share posts with members on the topic.Last year was the Year of the Doll-a very popular subject. Every year could be the Year of the Doll for me! I got the rug all cleaned up and it fits! The colors are perfect in my little house. It was a bit of a job moving the table and getting the rug in.The girls like it...hope Jimmy will think it works when he gets home. $20 was a good price, especially for wool. I know the internet has a dark side, but I don't think of that part of it. I am so thankful for all the dear friends I have met via this computer! Isn't it amazing to have sweet friends all over the world and be able to chat with them and get to know about their lives? I think it's kind of like the Pen Pals I used to have, but much better! I'm thankful for my friends and the world that the internet has opened up to me. Enjoy this beautiful summer day and remember it's a Day of Rest. Thanking God for my friends and family this morning. 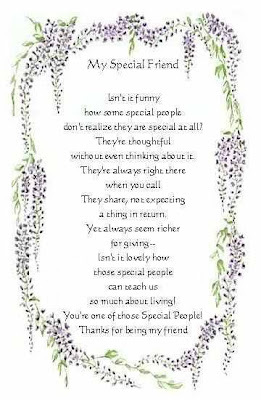 Found this little friendship quote to thank my friends for their gift of friendship! My Veggie Garden...I'm a Newbie! I was chatting with LaVonne via IM the other morning. It's so fun~kind of like my mom used to do with the neighbors over coffee when I was young. LaVonne and I have our coffee and type away! Pretty funny. Anyway, this post is for her. She has been so kind to encourage Jimmy and me to try some gardening this year and supplied us with lots of seeds! Despite our very wet spring and cool summer, we are getting some treats from the garden! It's been fun and we're learning. My handyman Duane who built our cottages also mows for me. He said we had the best tomatoes of all of his customers! Not bad for beginners. Of course, Jimmy would say it's because he's Italian. Ha ha ha! So, this is for you LaVonne...thanks again! Can you see the little cukes coming? A variety of tiny grape and cherry tomatoes. I like the dark heritage one the best but the yellow ones are really sweet. Walla Walla onions...my very favorite! A few peas....some didn't make it so we didn't get many-will do better next year! Beautiful kale! Our Dutch friends said they love kale. LaVonne said to dry it and add it to soups. Here's some more tomatoes for snacking. The picture is a bit blurry...guess I was in a hurry to eat them. Another week slips by and it's time for Miss Spenser's Teacup Thursday! We are finally getting a bit of summer weather and we may hit 90 over the weekend. It hasn't happened this summer, so everyone is talking about it! I got this Paragon teacup last weekend in Aurora. I always tell myself that I don't need another pink teacup, but......it is so really pretty and I didn't have a Paragon. This is a little sewing box I got several years ago in Port Townsend. I really love it and keep my sewing treasures in it...thimble, tatting shuttles, Tiffany scissors, ribbon threader and many other special items. I found the cute little Frozen Charlotte twins at the show too. The seller thought they may be a little pin keep. You can feel the dolls inside of the fabric. I just like them as I love tiny dolls. Be sure and hop on over to Miss Spenser's Teacup Thursday so you can enjoy the posts and see the most wonderful cup and saucers that our members own. It's so fun to see all the lovelies. I hope to work on my quilt tomorrow that I started before vacation. I need to finish it for my friend. A Day with Papa and the Woolworth Display. My dad has been asking my sisters and me to put up a Woolworth display in an empty case at his retirement home for months! I was waiting for my "teacher" sisters to be on summer vacation and then it was waiting for us all to find a good day to do this for him. We really had fun! I took some of my dolls and things I had saved from my childhood (Woolworth goodies) and my sister got his box of memories out of his storage unit, so we had a good amount of items for the case. It was so fun growing up in a Woolworth family and we sure had a lot of funny stories to share as we put up the display. Dad was happy-you can always tell because he whistles when he's content. I know he likes having his daughters around and his granddaughter Ms Maria was with us too. She's his youngest grandchild. I had fun gathering my dolls. I love old dolls and it dawned on my this summer that the dolls from my childhood are 50 years old or older, so I think I should be taking better care of them. My mother sewed clothes for them and I have kept those too. 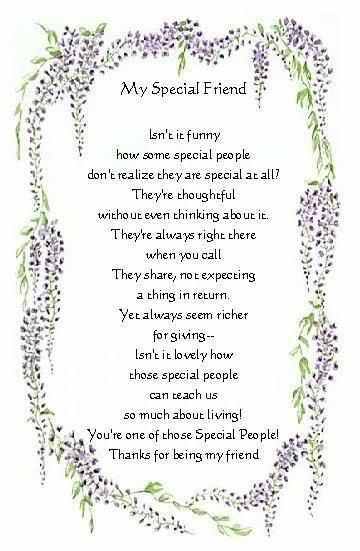 They are treasures! These are two of my baby dolls and some of their accessories that I've saved...yes, I'm a sentimental keeper who has a hard time parting with things. This is my tea set from my childhood. It's made in Japan and only one handle is broken! Not too bad for years of playing and moving. These are a few pictures of the finished product. We think it turned out pretty good and the residents will enjoy looking at dad's career and some history of all those years with the company. I still miss the days of the "Five and Dime"-many happy years gone by. This is my dad....know as JW or Papa! He looks happy. A Fun Day In Aurora! As if we didn't get enough antique time on our vacation...ha ha ha! I was reading through my mail and discovered that the Aurora Antique Street Fair was on Saturday! 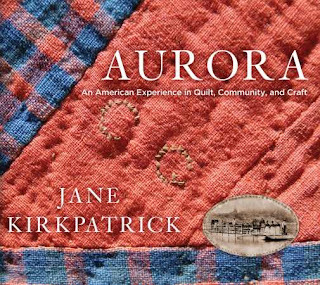 Aurora is one of my very favorite historical towns about an hour from our home. 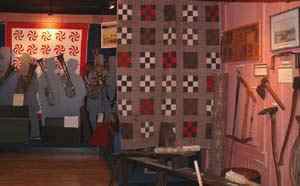 We are members of the historical society and I love to attend the annual quilt show there every October. We saw an estate sale sign on the way out in the farm country, so our car just took the detour. The nicest family was having a big family sale and the were so cute. Jim found items for his booth in October and I found the neatest children's wooden carpet cleaner. They sold us a beautiful round wool rug for $20 and I'm hoping it will fit under my table in the dining room. I haven't had time to try it out yet-hopefully tomorrow. We drove on out to Aurora for the show. The museum is wonderful and we always take in the current exhibit. Near the octagon building we found the ladies spinning and as I wondered around, I spied a lady using an antique sock machine! Her name was Joanne and she was so kind to show me what she was doing. I had to tell her about my friend LaVonne in Montana and her difficult journey with her sock machine. When I told her LaVonne comes to visit me a few times a year, she gave me her card and said she'd be willing to have us come and visit. She has two machines, so LaVonne could use one of hers. She said they can be really tricky to get the tension correct. Such a nice lady to share so much of her time with me. Her socks were beautiful. This is a picture of the octagon building. The artists in the area painted doors to raise money for Habitat for Humanity. We all got to vote for our favorite, but I'm not sure who was chosen as the winner. I loved this long wooden chicken feeder. It sure has character-bet it could tell us a few stories! Who wouldn't want this bunny hutch for your favorite rabbit? It's adorable with a spendy ticket! Jim found this starch box~great patina and end label still in good shape. It lives with us now! 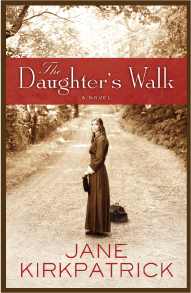 wait to read her latest work.......The Daughter's Walk. Her non fictional book on Aurora is full excellent! A Tasha Tudor find on vacation! A Lovely Afternoon in Washington!